← Take Advantage of Your “Use it or Lose it” Flex Spending & Vision Benefits at Professional Vision Timonium & Carney! We live in an age where more and more people have some form of computer monitors in front of their eyes throughout much of their waking hours. How long would you estimate that you have either a smart phone, laptop, tablet, or desktop computer monitor in front of your eyes each day? At Professional Vision Timonium & Carney, we’re proud to offer patients some of the best lens technology available to help those with many visual demands. 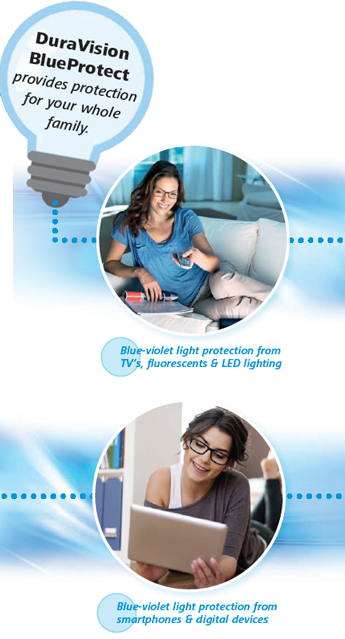 ZEISS DuraVision BlueProtect eases eye fatigue and eye strain from damaging blue light associated with smart phones, computers, and other digital devices. Feel free to contact us or stop by our Timonium and Carney offices with any questions. Dr. Richard Barnstein is an optometrist / partner with Professional Vision in the Baltimore area. ( Timonium and Carney ) Professional Vision is a boutique eyecare practice, with fashionable designer frames and sunglasses. We have an eye doctor available for eye appointments for contacts, comprehensive eye exams, and treatment of eye emergencies 6 days a week, at Timonium & Carney. Dr. Richard Barnstein, a Baltimore native, graduated from the Pennsylvania College of Optometry (now Salus University) in 1994. He attended James Madison University (1987-90) where he was accepted early into optometry school. Dr. Barnstein is therapeutically licensed to treat eye disease, and diagnoses and manages glaucoma. He also specializes in difficult contact lens fittings, dry eye disease, and LASIK co-management. Dr. Richard Barnstein is a member of the American Optometric Association and the Maryland Optometric Association. Dr. Richard Barnstein enjoys spending time with his wife, 2 children, and puppy goldendoodle. He's an avid Ravens, Terps, and Orioles fan, and loves live music. Profession Vision on Twitter Dr. Richard Barnstein on Twitter Check out Dr. Barnstein's Live Music and Sports Blog, Farmerstanproductions! This entry was posted in blue light, ZEISS, ZEISS DuraVision BlueProtect and tagged baltimore, better lens technology, Blue Light, boutique designer eyewear, carney, cockeysville, dr barnstein, dr. richard barnstein, eye, eye doctor, eyedrbarnstein, hollie brannan, michael andreaggi, perry hall, professional vision, timonium, vision, white marsh, ZEISS, ZEISS DuraVision BlueProtect. Bookmark the permalink.